Use the "Check For Updates" command on the Help menu. If a new version is available, the Check For Updates window will appear. Use the "Check for program updates" option, in the Program Options. Depending on the specified trigger for update checking, the Check For Updates window will automatically appear when an update is detected. If a more recent version is available, a window will be displayed listing the latest changes, which will usually consist of bug corrections and enhanced features. The changes are also listed on the version history page. If other people are logged into the same computer and also running VueMinder, a reboot will be necessary to complete the update installation. 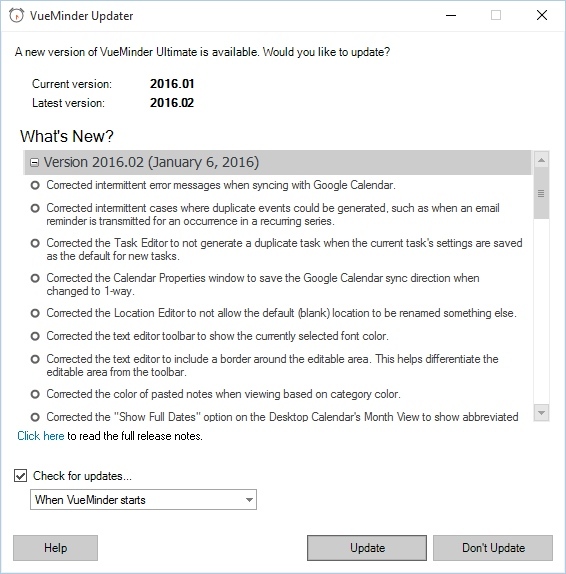 A checkbox is provided to control whether VueMinder will automatically check for updates. This can also be controlled via a Program Option. If you'd like to manually check for updates, you can use the "Check for Updates" command from the Help menu. When automatic update checking is enabled, you can choose to have VueMinder perform the check whenever it starts, daily, weekly, or monthly. If an update is available, you can click the Update button to initiate the update process. The latest version will be downloaded. A progress bar will show the download status. 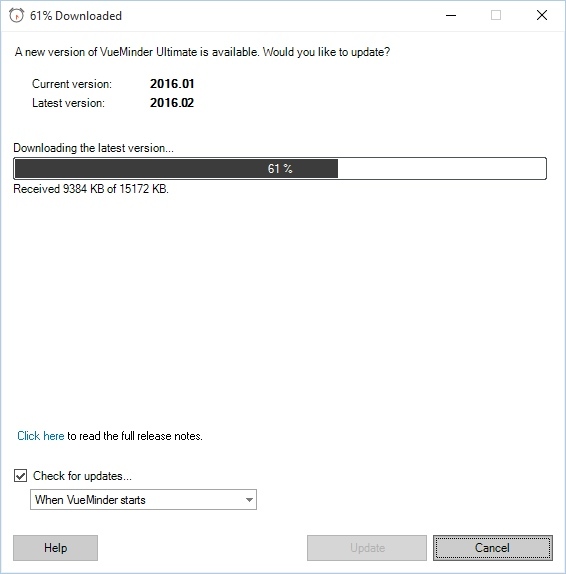 You can minimize the window while the download is in progress, if you'd like to work on other programs outside of VueMinder while the update is being applied. 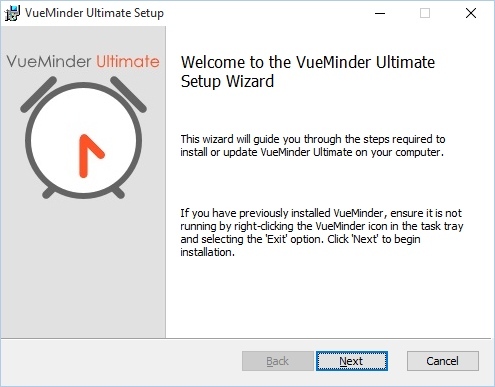 After the download completes, your data will be saved, VueMinder will be closed, and a Setup Wizard for the latest version launched. Follow the prompts of the wizard to install the update. When the installation is complete you can choose to restart VueMinder. New versions will always be backward-compatible with your existing data, so there's no need to worry about data being lost when updating to a new version. New versions are always virus-scanned by VueSoft and then digitally signed with an Authenticode certificate. This provides you with our assurance that the update has not been tampered with and is free of viruses or any other type of malware.